It is not clear what kind of customer involvement leads to optimal service innovation. An integrative approach is needed so as to link the practices of how a firm involves customers in service innovation to the advantages it is seeking. 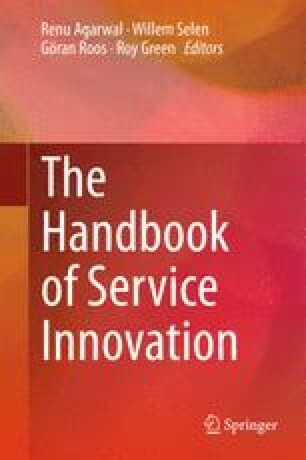 We apply previous research into service-dominant (S-D) logic and open innovation in order to study the practices for involving organizational customers in service innovation. Our empirical research is based on case studies on six globally operating technology companies known for their innovativeness and service-oriented business with their organizational customers. We describe customer involvement practices based on their openness as in-house development and supplier co-operation, development based on customer insight, co-development with customers, and development by customers. We find that, in addition to obtaining information, ideas, and development partners, these customer involvement practices are used for shaping the context of value co-creation, fostering network effects, living with contingency, and engaging in business with meaning. We also contribute by bringing the research streams of S-D logic and open innovation closer together. The authors wish to thank Tekes—The Finnish Funding Agency for Technology and Innovation—and VTT for supporting this research. Our sincere gratitude also goes to the company representatives and our research colleagues that have given their time and shared their ideas for this research.